You can create an account on Zanata using an OpenID login (such as Google or Fedora), or by creating a password specific to Zanata. You can set or change your password and add OpenID accounts to your Zanata account at any time. *Note: If you want to translate a JBoss-related project, use the translate.jboss.org site, which requires a jboss.org account. You can create a jboss.org account at the jboss.org registration page; Fedora projects should use fedora.zanata.org; The general open source projects should use translate.zanata.org, which is used in the following instructions. Click Sign up at the upper right of the page. Select your OpenID type or enter an OpenID URL. Confirm with your OpenID provider, after which you are returned to the Zanata page. Complete the Name, Username, and Email fields. Ensure your email address is entered correctly. Click Save. This sends a validation email to the address you entered in the previous step. 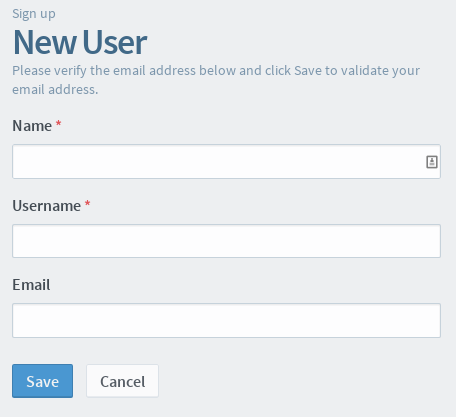 Open the validation email and click the validation link. You can now sign in to Zanata using your OpenID credentials. Complete the Name, Email, and other details. You can now sign in to Zanata with the user name and password you entered in step 2. If you registered with OpenID, you can still set up a password and sign in directly. To set a password, click Change Password under your profile settings and enter the desired password. You can add OpenID accounts to your Zanata account after it is created. You can have several different accounts linked to the same Zanata account and sign in with any of them. Click the profile avatar at the upper right of the page to display the menu pane. Click Settings and then click Manage Identities. In the Actions menu, click Add New Identity and follow the procedure described earlier. Note: if you want to translate a project that falls under the Fedora CLA, you must add a Fedora OpenID to your Zanata account. You can then sign in with your password or any OpenID account and be allowed to translate Fedora projects.